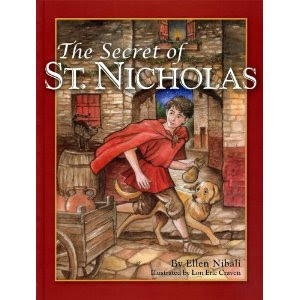 Just before Thanksgiving, we received a copy of The Secret of Saint Nicholas to review. What a wonderful book! The children and I have read the story of Saint Nicholas secretly tossing gold coins into the stockings of three girls about to be sold into slavery several times and the little ones are just as enthralled with it as they were the first time that they heard it. Ellen Nibali writes the tale well, using a style that is easy for children to understand and yet pleasurable for the adult who is reading it to them. The illustrations by Lon Eric Craven are beautifully detailed and the colors are magnificent. I was thankful that the author took the time to write a note to teachers and parents mentioning the fact that the story told in this book is inspired by an event in the life of Saint Nicholas. It is important to point out that Saint Nicholas was already a bishop when he performed the good deed of dropping the coins into the stockings and not a teenager as the story portrays. If you are looking for a good book to give to your children in honor of Saint Nicholas, this is it! The Secret of Saint Nicholas will be a treasured read in our home for many Decembers to come! I am always looking for books about St. Nicholas that do not make the connection to "Santa Claus". Can you tell me if there is any mention of Santa Claus in the text or is it just about St. Nicholas? - thanks! "Perhaps best of all were the three good deeds he did in secret. For on Christmas, the birthday of Jesus, boy and girls all over the world rush to see what new good deeds were done in the night. And that began with a boy named Nicholas and his three bags of gold." I thought that was such a sweet way of handling it! Does "Santa" visit your little ones? Or "Saint Nicholas"? Or both (as I know there is a Saint Nicholas day)? If that is clear, lol. I guess what I am asking is does anyone leave gifts for the children to open on Christmas morning? The children get something small on Saint Nicholas Day and a stocking and gifts under the tree on Christmas morning. They know that the gifts come from us.... the ones on Saint Nicholas day in honor of this wonderful saint and the ones on Christmas in honor of the Lord's birthday. Oh good - looks like another book for the wish list! I think the grandparents in our family would have been deeply wounded if we did not "do" Santa Claus - we do...so on St. Nicholas day we talk more about giving and preparing for the birth of Christ while enjoying stories and legends about this wonderful saint. St. Nicholas does leave a few things in shined up shoes - fruit, nuts, maybe chocolates....a little bird mentioned to me that St.Nicholas is leaving chocolate coins this year among our fruits and nuts! Thanks again for the review of the book.